Birmingham City Council has unveiled proposals for Phase Two of the regeneration of Perry Barr. The 12.27 hectare site (plan pictured above) would accommodate around 400 new homes, associated public open space and a new secondary school for 1,260 pupils. The area, between Holford Drive and Aldridge Road in Perry Barr, is adjacent to the site of the former Birmingham City University Campus — already being demolished to make way for the residential element of Birmingham 2022 Commonwealth Games Village, which will then be converted into approximately 1,400 new homes for the public post-Games. The Phase Two site is only due to come forward for development after the Games, as it will initially form part of the Athletes’ Village, accommodating a number of Games-time facilities such as the athletes’ dining hall and other temporary facilities. A drop-in session is being staged for existing residents to find out more about the plans for the housing and the school on the 20th February. Cllr Ian Ward, Leader of Birmingham City Council, said: “Birmingham is a growing, thriving, city and we are projecting a population increase of 150,000 by 2031 — so it is crucial we deliver the housing, infrastructure and jobs to support our young and growing population. 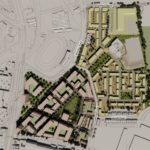 Following the end of consultation, which closes on 4th March 2019, all comments will be reviewed with any appropriate changes then being made before the submission of an outline planning application, ahead of an anticipated decision by the council Planning Committee in summer 2019. The secondary school, proposed to the Department for Education, would open in 2021 if approved.